My sister’s former home in Comox, BC. She rented this tiny cabin in the woods for about a year before she married. It was a great place to visit. 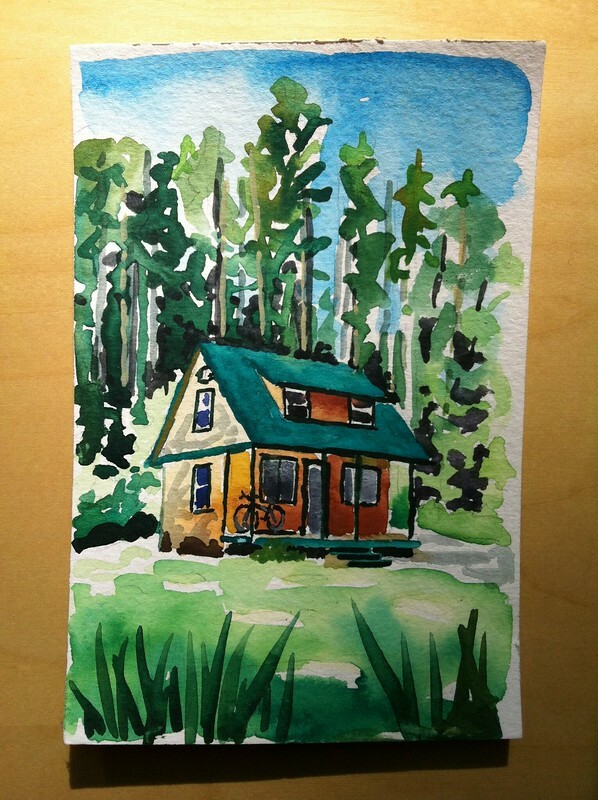 She now lives closer to Courtenay with her husband — still in the woods. One of my many Austrian cousins has arrived in Canada with his family of four. After two days of sightseeing in Vancouver, I have brought them and the German teenager to my sister’s in Courtenay on Vancouver Island. We are spending a couple of lazy days here. Lazy means beach time, swimming, canoeing and light hiking. We don’t want to do too much this week because we are resting our muscles for the Juan de Fuca hike that we are starting on Saturday. I am getting excited about the hike, especially since the sunny weather looks stable. To everyone’s amusement, I sometimes have to act as a translator between my Austrian cousin and the German teenager. Admittedly, Austrians can be a bit sloppy in their pronunciation. The phonetic difference between “b” and “p”, as well as between “d” and “t” is wasted on Austrians, meaning the rest of the German-speaking world has to rely on context if they want to understand an Austrian. On the other hand, perhaps to compensate for their omission of consonants, Austrians have added a bunch of gratuitous vowels to their speech. This results in a bit of a twang, the most extreme expression of which is yodelling. But most crucially, the Styrian dialect that my relatives speak is not at all like High German. It’s Arnold Schwarzenegger German, and it’s my true mother tongue. I bring many years of trying to understand what my mother is saying to the table of Austro-German relations. I also have, among my mother’s eight brothers, both an Uncle Hans and an Uncle Franz. SNL wasn’t making this stuff up. About 87% of every Austrian family has a Hans or a Franz. 86% has both. 71% of every Austrian family also includes a ski instructor. Sure enough, Uncle Hans was a ski instructor for many years when he was younger. The chance of having all of that concur is somewhat lower, but still pretty gigantic.